Things our Pop (Dad’s father), used to say. That joker down the road. We miss him. School holidays arrived and baking for both chilluns and the spouse was required. 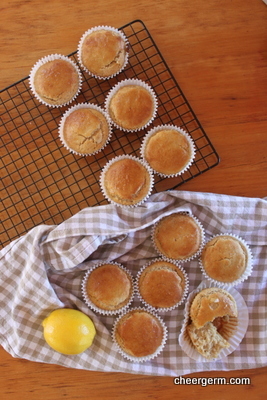 These muffins have a lovely soft crumb, a fabulous sharp lemon zip and an ever so slightly crunchy top that will put the zing back in your zang. Vanilla is always your friend when baking, gluten free people. (The comma saves this rather odd sentence, rest assured this Cheergerm does NOT advocate the baking of real life gluten allergic/intolerant human beings.) In all seriousness, one cannot advocate the use of vanilla enough when baking sweet goodies using gluten free ingredients. Being a huge fan of vanilla beans, vanilla bean paste and pure vanilla extract, I am quite excited to try the new vanilla powder that we ordered in our most recent food co-op order. It arrived too late for these luscious lemon ladies but there will be much vanilla powder experimentation in the future. I regularly bake a gluten laden version of these (with a mixture of spelt and wholemeal flour) and the progeny couldn’t tell the difference. These muffins are as good as gold, just go ask that joker down the road. Sift the self raising, sorghum, buckwheat, baking powder, salt and xanthum gum into a large bowl. Mix in the almond meal and 2/3 cup sugar. 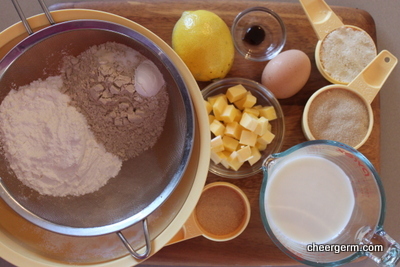 Melt the butter, add the egg, milk, vanilla and lemon rind and beat well with a fork until combined. 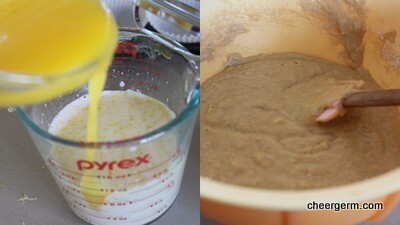 Add the liquid to the dry ingredients and combine until the dry ingredients have been slightly dampened. Divide the mixture evenly between a 12 medium-sized muffin tin lined with muffin cases and sprayed lightly with a non-stick spray. 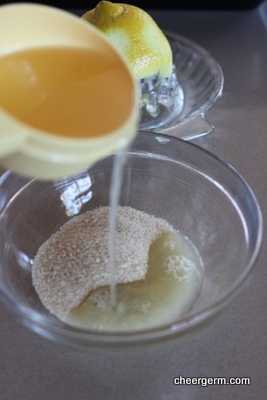 Stir the lemon juice and sugar without dissolving the sugar and drizzle this over the hot muffins as soon as they are removed from the oven. 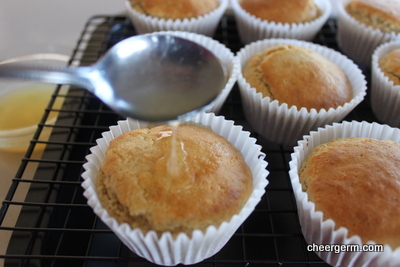 Muffins tips: make sure all of your wet ingredients are room temperature and don’t overmix. 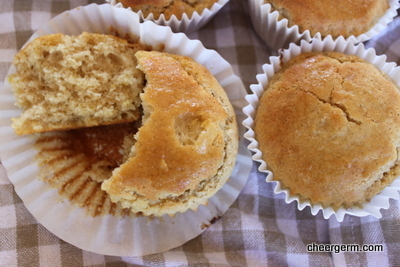 This entry was posted in Gluten free baking and desserts and tagged baking, buckwheat flour, cheergerm, Cooking, family memories, gluten free, gluten free lemon muffins, lemon, recipes, sorghum flour, vanilla. Bookmark the permalink. Why thankyou for popping in and having a squiz! Delicious muffins! I love anything with lemon. 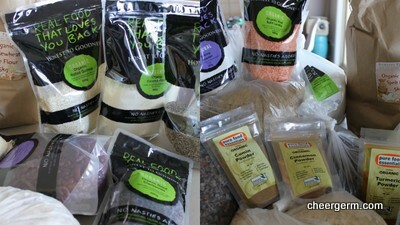 Admiring all the organic goodies in the photo, I see a few familiar labels. 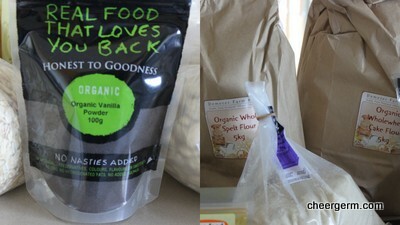 Demeter Farm Mill’s biodynamic unbleached ‘white’ spelt flour is fabulous for breadmaking. We lemon lovers sure have it going on! Lemony is good. 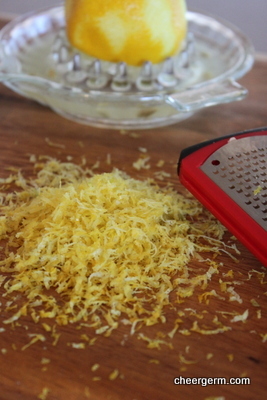 Your picture of lemon zest made me salivate!! Thanks lovely LM! It was one of my fave photos from that lot. One needs to only say the word lemon and I am chomping at the bit. I adore the puckeriness of citrus. And finding the perfect blend of sweet and sour is nearly magical. These muffins are drool-worthy and are going on the grocery shopping list this week. Another gorgeous addition to the growing gluten recipe file. Cheers! Thanks Madame P! They were a hit with the Yak and were even fed to outsider children (not random children outside but friends of the family) who loved them and had no idea they were gluten free. Score. You crack me up. It’s like hiding veggies in things…often my boys say ‘I don’t eat blah blah’ and I snigger to myself thinking ‘oh yes you do…’ We are great mothers and will receive rewards, apology letters and accolades when our babies are all grown up and left home….we will won’t we? 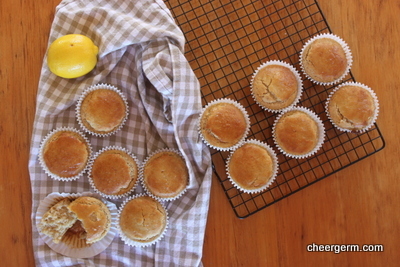 I love almost anything with lemon (food, cleaning products, scratch n sniff) so you had me at ‘muffins’. This is a lovely looking recipe, I especially like the sound of the topping, presumably the sugar stays a little crunchy? Yum! Thanks, they are moreish. Scratch n sniff blogs, think that could be the next ‘big thing’!? It is delicious, I knocked back the sugar in he topping so it’s just a wee bit crunchy. You could always add a tad more! Thanks KW, mayhaps even right as rain as well! yum.. love a good lemon muffin! thanks for the great recipe – definitely one i am saving! Nicely placed comma, my friend 😉 I love baking with lemon and these muffins sounds so tasty!